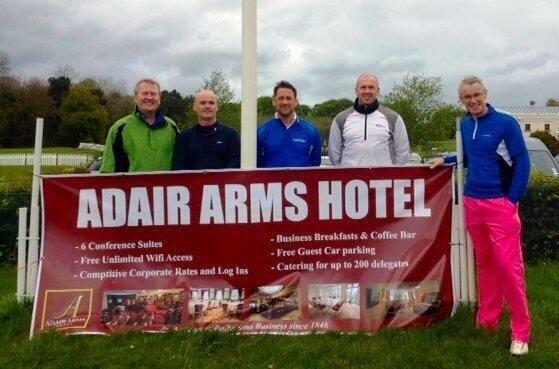 The third annual Ballymena Borough Chamber of Commerce and Industry Golf Day, sponsored by the Adair Arms Hotel proved to be another tremendous success. Over 60 golfers (of varying degrees of ability!) took part in the four-ball competition at Galgorm Castle Golf Club on Friday 9th May. It was a colourful sight to say the least with each golfer donning a pink item of clothing in keeping with the theme of the Giro d’Italia, which was scheduled to pass through the town. Chamber President Alan Stewart commented “We would like to take the opportunity to thank all of our sponsors and the staff at Galgorm Castle Golf Club for contributing to the success of the afternoon. The Chamber Golf Day is getting bigger each year, thanks to the commitment of our members who came out once again to support the competition. Congratulations to all of the winners of the various prizes, please look out for information on the 2015 Chamber Golf Day later this year”.